Researchers at the University of Wyoming have created a method and a software program that automates electron beam lithography over several nanostructures, i.e. nanowires, which is generally done under a scanning electron microscope (SEM). A nanowire is a nanoscale rod made from a variety of materials (e.g., copper, silver, gold, iron, silicon, zinc oxide, and germanium) and is used in miniature transistors, sensors and some laser applications. The lithography over nanostructures is done to construct devices such as transistors, sensors, chips, etc. NanoMap is designed to produce individual lithography patterns over several nanostructures in the single processing time. There are two modes in which the software can be run: manual mode and automated mode. There is no hardware required to operate the software in manual mode. Manual mode produces calculated data for the position and orientation of the nanostructures while lithography is done manually. In automated mode, the software calculates position and orientation of nanostructures and communicates with SEM through a third party software called “Nanometer Patterns Generation System (NPGS)” to do electron beam lithography over nanostructures. The automated mode allows to mass produce nanostructure devices by automatically processing lithography over several individual nanostructures. NanoMap reduces error on the lithography process over nanostructures by eliminating ‘Alignment’ procedure and eliminates the possibility of human error in nanowires position calculation. It reduces overall lithography processing time. 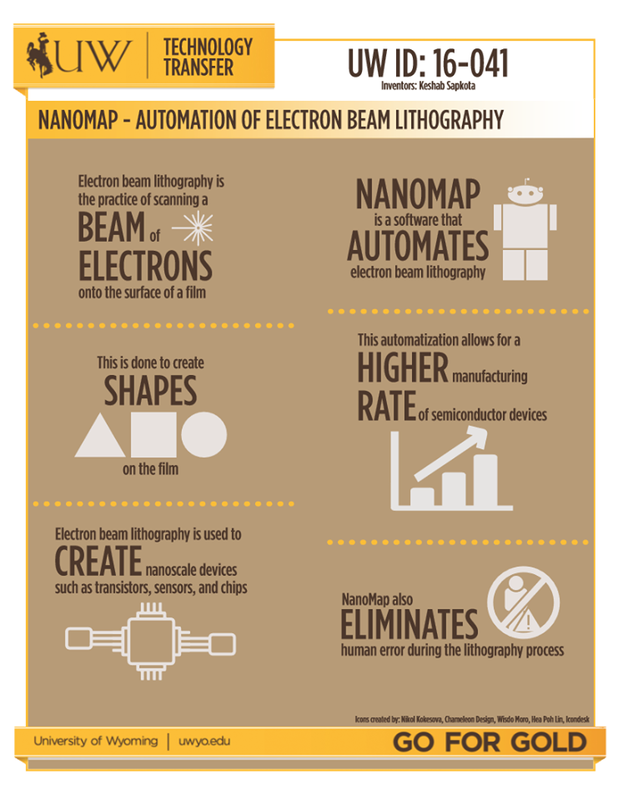 Along with NPGS, it makes lithography over nanostructures an automated process. It can be used to mass produce nanostructure devices, eg. nanowires, carbon nanotubes, nanostripes, thinfilms, etc.